The Git Hat… Started life September 24th 1988. We had been taking part in the War of The Roses Competition, the War of The Roses being an ‘It’s A Knockout’ type competition between the Yorkshire and North-West Areas. At the dance in the evening the DJ wanted to do more than just play records so to continue the spirit of competition he provided modelling balloons and invited us to make balloon animals… perhaps just a bit tedious for Waffle-Ale 18 Plus, so after the balloon animals had been made we appropriated the left over balloons and proceeded to twist several together in a haphazard fashion, and then we put the creations on our heads and made them into hats… hats for gits… Git Hats to do git dancing in (there’ll be an explanation of git dancing in a later post I expect). 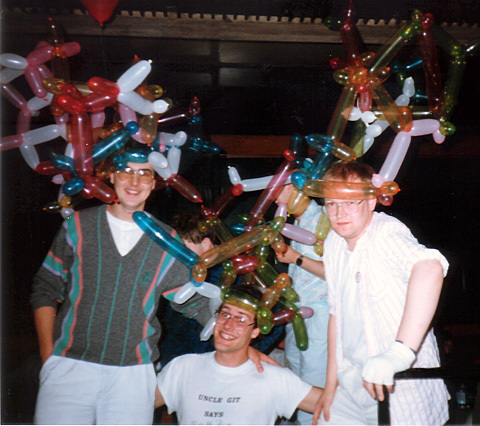 We then proceeded to take more balloons and fasten the hats together to make larger more elaborate multi-person hats, which obviously then involved synchronised movement and dancing… though one person could duck out leaving the others to support the millinery until their return… or some other git took their place in the line-up. We were so amused with this idea that at the next event, the Cleethorpes Sandcastle Competition – which was only a week later, we came armed with our own balloons and made similar hats… Then a fortnight after that the Git Hats made an appearance at Hunstanton, thanks to it being the home of the worlds biggest joke shop, which supplied modelling balloons. That was the last instalment in the brief life of the Wharfedale Git Hat’s… fashion is such a fickle mistress – well apart from an odd resurgence of the Git hat at random fancy dress dances over the next few years.